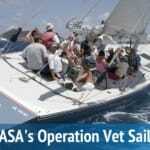 ASA Sailing Instructor clinics test existing skills and knowledge while teaching a structured curriculum and proven presentation techniques. ASA certified saling instructors have proven they measure up to a national standard which is used by more than 90% of the commercial sailing schools in the country. Take the challenge and attend an ASA Instructor Qualification Clinic (IQC). Is there a minimum number of students per year required to maintain your instructor status? Thanks for your question, George. Currently there is no minimum number of students required.